250cc: First 2004, Second 2014, 2017, Third 2001, 2003, 2006, 2007, 2010, 2015. British Best Pairs: Second 2000, Third 2006. Eastern Centre Championship Winner: 2007, 2013. South Midland Championship: First 1999, 2018. Midland Centre Championship: First 2003, 2004, 2005, Second 2017. South Eastern Centre Championship: Second 2002. Champion of Champions: Second 2003, Third 2002, 2005. David Nix Memorial: First 2004, 2005, 2006, 2007, 2010, 2011, 2012, 2013, 2015, Third 2003. 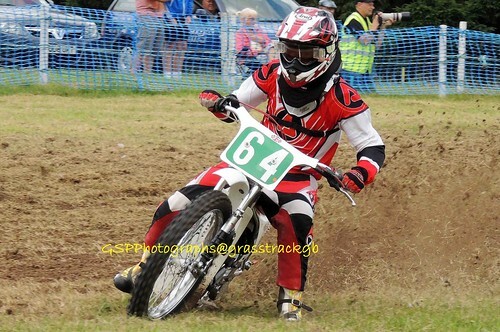 Festival of Grasstrack: First 1999, Second 2003, 2004, 2013, Third 1997. Jim Coles Spectacular: Second 1999. Jon Underwood: First 2017, 2018, Second 2001, 2002, 2007. Master of Midshires: Second 2015, 2016, 2017, 2018. Ledbury Leader: Second 2015, 2017, Third 2016. Three Pairs Flyer; First 2004, 2005, 2006. 2018: First Cheshire, Pickering, Second Worcester, Pickering x3, JCR; 2017: First Cheshire, Pickering, JCR, Second, Ledbury, SCA, Cheshire; 2016: First SCA, Worcester, Pickering, LOGA, Hayes & Southall, Bewdley, Second Ledbury, SCA, Third Ledbury; 2015: First Wainfleet, Hayes & Southall, Fenland, LOGA x2, Second Cheshire; 2014: First LOGA, Cheshire, Burton & Leicester, Pickering, Dunmow, Wainfleet, Second LOGA; 2013: First SCA, Bewdley, Cheshire x2, Ledbury x2, Burton & Leicester, Danebury; 2012: First Lancashire, Yorkshire, Cheshire, Worcestershire; 2011: First Lancashire, Pickering x4, Yorkshire, Second Wainfleet; 2010: First Lancashire x3, Yorkshire x3, Pickering x3, Second Pickering; 2009: First Yorkshire x2, Pickering, Lancashire x2; 2008: First Pickering x3, Second Burton & Leiceste; 2007: First Wainfleet, Lancashire, Second Burton & Leicester x2, Lancashire.